I’ve been wandering again in my reading. I took Starr back to the library, and renewed Bancroft, but set him aside, and picked up another book recommended to me: Over the Edge of the World: Magellan’s Terrifying Circumnavigation of the Globe, by Laurence Bergreen. Yes, it has one of those cheesy hyperbolic titles, and some pretty crappy writing. But overall, it was a fun read. Besides, it was referred to my by a fellow cyclist who passed it along because of our mutual interest in sailing. The funny thing is, there is no real sense of terror in the entire book. Lots of squalor, some mutiny, the usual death and suffering by scurvy. But no outright sense of terror. 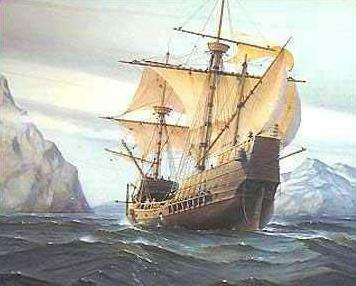 And as we all know, none of Magellan’s ships fell off the edge of the world, and as a matter of fact, Magellan himself didn’t circumnavigate the globe. He died in the Philippines as a result of getting involved in an intertribal skirmish. So the title is pretty much all a lie. But the point I want to make here is that we all learned about the Age of Discovery in school. How these brave men went out to discover the unknown parts of the earth. When really, they were all looking for the same thing: a route to the Indies, a tiny island group southeast of the Philippines, to secure a monopoly on the spice trade, or at least a steady supply. The Ottoman Turks had cut off the land routes to Asia, so Europe set out to discover a sea route. The Portuguese went east, the Spanish went west. Columbus and Magellan sailed, each in a different direction . . . for commerce. I realize that’s reality – expeditions are expensive, and kings want empires, and more importantly, empires that make money, not just discoveries – but I still think it’s sort of depressing.